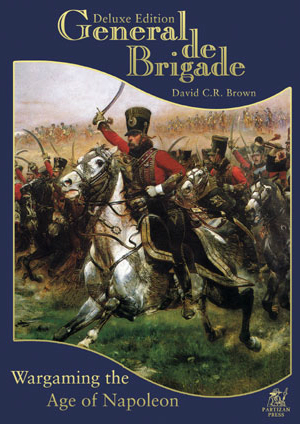 Not that long ago we (David, Magnus and I) teamed up for some more General de Brigade. As David is the more experienced of us, he took command of his French troops to defend a ridge line against a Russian Prussian coalition. Magnus and I had two brigades each, I used my Landwehr and was supported by some more experienced Prussians from Davids collection. Magnus took the role of main attack against the ridge, while my troops that consisted a fair amount of skirmishing troops attacked against the village. The Landwehr was assigned the role of reserve, witch in hindsight was rather stupid of us. As my better troops became the "cannon fooder" a role that the Landwehr is more suited for. Before hand we decided to play eight turns, but by then we had only started to engage the French lines, we added two turns. As the Russians advanced they where constantly harassed by French skirmishers and on their left flank the French Cavalry positioned itself to threat the entire Russian side.The Russian artillery proved to be quite ineffective, this from being placed to far from the enemy, being to few and well being Russian artillery! But when the Russian arrived at the French lines they did quite well forcing them back, David had prepared for this though as he had a Battalion in reserve behind them, and then the cavalry charged in and ended the assault. On the Prussian flank, the skirmish engaged the enemies skirmishers, where it has to be said that the Prussians won. But the line infantry fared much worse as they threw them self into the elite French infantry that easily foiled all attacks with musket fire.